Now is the perfect time to install an orchard mason bee house in your yard. The metallic blue-black mason bees, if you’ve never encountered them, are a welcome addition to our backyards and gardens, because they’re native, they don’t sting (unless you step on a female who has a stinger, unlike the male), and they make busy work of pollinating our fruit trees, vegetables, and berry bushes early in the season. I’ve seen a lot of press recently about mason bees (who get their name from the way they seal their nests with mud), and so I made a mason bee house over the weekend in less than an hour. The source that first inspired me came from Pinterest and then ultimately from the National Wildlife Federation. You can find various instructions for making the houses on the Web from wood, almost like making a bird house, or with small tubes made from bamboo or even straws. I decided to make this model after finding a perfectly sized block of wood in the alley. 1. 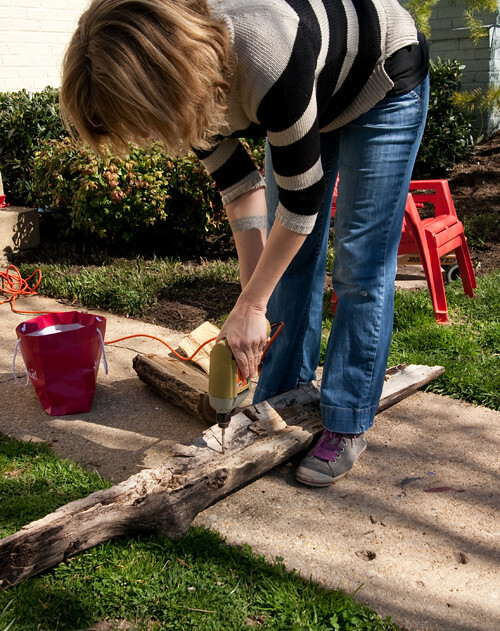 Get a block of wood that’s at least 5 inches in diameter and longer than a foot. 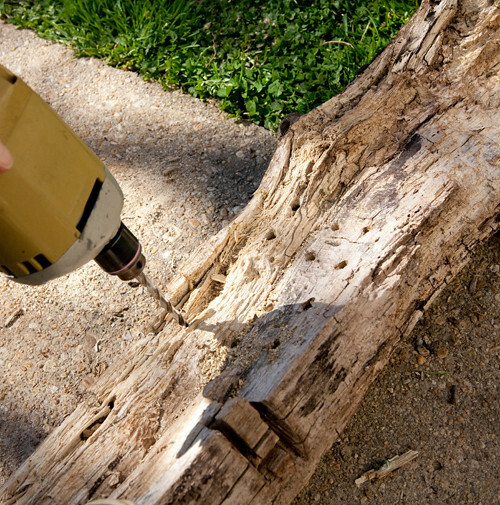 Use a 1/4 drill bit and drill approximately 30-40 evenly spaced holes about 3-5 inches long into the wood, but do not go all the way through. 3. 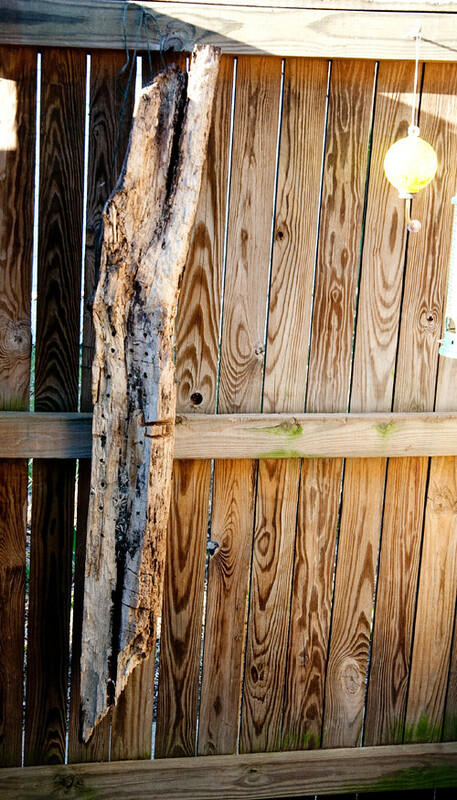 Add an overhang so that the holes won’t get wet when it rains. I still need to fashion one for mine, but I have a few days to do so since the forecast is for dry, sunny (and warm) days for the week ahead. Add nails in the side so you can add wire or garden twine in order to hang the house. 4. Find a way to hang the house in a location that will receive morning sun. 5. Keep an eye out for bees! Make sure the house will stay dry by adding an overhang. Angle the holes so any moisture that gets in can drain out. Make sure the house doesn’t move in the wind; the bees won’t be inclined to live in a house that moves. Hang at least four feet higher or even higher if possible to make sure rodents or raccoons or other pests don’t get to the nectar and pollen. Create about 30-40 holes because mason bees like nesting close together. Too many and they can’t keep track of their hole. Are mason bees the same as the dreaded carpenter bees? Some worry that making a mason bee house will attract carpenter bees, but it’s just not so. 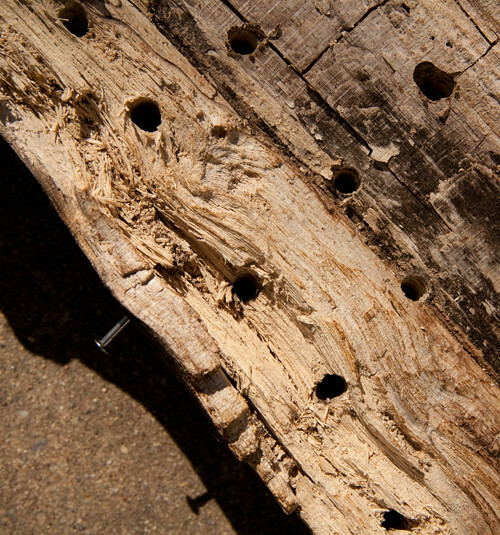 Carpenter bees burrow into wood, but the mason bee finds an existing hole, like an insect or woodpecker hole, in which to build a nest. Within the next month or so, I’ll be looking for the females going to and from the house with their nectar and pollen. They’ll eventually stay in a hole and lay an egg and then repeat the activity in the same hole, move on to another hole, and do this routine on and on for about four to six weeks. After that, the female bees will die. While they’re doing their routine of pollen and nectar collecting and egg laying, the male eggs, which are the ones the female laid toward the front of the holes (the female eggs are in back), will hatch and eat the nectar and pollen inside the hole, and the spin a cocoon to last all winter. Next spring, the males will come out of the bee house first, followed by the females. It only takes two or three mason bees to pollinate a mature apple tree. They’re better at pollination than honey bees and they do it in the rain, which honey bees don’t. They’re also solitary and so less likely to succumb to disease. Another interesting fact: They don’t make honey. My goal is to build more mason bee houses (some from the bamboo tubes) and hang them in my daughter’s school courtyard, the community garden, and other places around town. Adding a bee house to your yard is a great way to meet one of the qualifications for becoming a backyard wildlife habitat too. That is simple enough. I like the idea of putting holes at a downward slant allowing any rain to drain out. I just got started and my daughter is into Mason bee raising for her trees and vegetable garden. Have had great success with the Mason bee houses. Mine had roughly fifty holes and all holes were filled by the second summer. We also provided the plenty of flowers to polite and there was an ample sully of clay nearby. Be aware that holes need to be cleaned yearly to prevent the spread of mites or disease. Healthy bees are very important.